Total Score: 8.83 - EDITOR'S CHOICE! Introduction: If you are like most anglers you probably started out with one or two rod combos and as your passion for fishing grew so did your collection. It really doesn�t take long for most anglers, especially bass fishermen, to accumulate such a large collection of rods that it starts getting hard to keep everything organized. Eposeidon�s Kastking brand tackles rod organization and storage with their aluminum rod racks, which made a big splash at ICAST where they originally debuted and won a Best of Show Award. Looking for a rod rack to store your rods? Impressions: We have all seen them, those old school wooden rod holders, or those that are made to look like they are made out of wood. These classic rod holders get the job done but unless you literally have a cabin, or a wood paneled room at home made to resemble a cabin, they may not necessarily match the d�cor of your home. On top of that they also have their functional limitations in terms of the ability to accommodate rods of very small or very large diameters, as well as holster complete outfits with the reels butting up against each other. 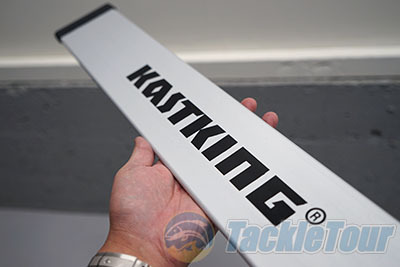 Kastking wanted to create a more modern choice, which was not only more conventionally styled, but also provided anglers with an easier to deploy design. To start with the Kastking rod rack is constructed out of aluminum versus wood, making it much more contemporary looking. This appealed to me as I was looking for a set of rod racks to hold test combos at the lab, which isn�t decorated at all like a wood paneled cabin. 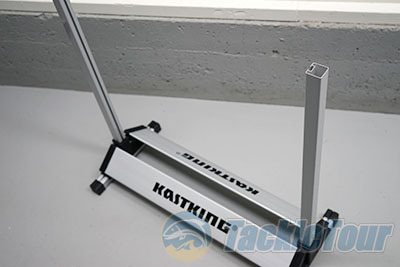 The Kastking rod rack comes in two variations, one that holds 12 rods and another that holds 24. 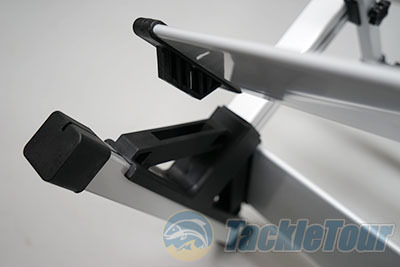 We opted for the larger capacity option, which is designed for both freshwater and saltwater rods, to maximize storage. We ordered two of these racks directly from Amazon and they arrived in relatively small boxes as setup is required. 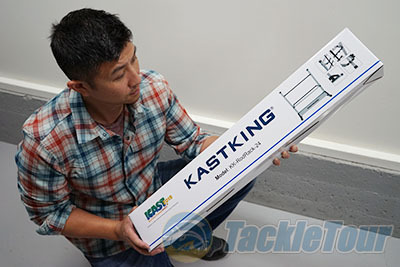 Setup: You can put away the screwdrivers and glue, the Kastking rod racks are designed for quick and easy setup, all without any tools whatsoever. When you first open the box you find all the aluminum parts and all but the top plastic caps already come installed on the aluminum arms. Instructions come bundled in the box but the setup is so intuitive you probably could easily set up the racks without even glancing at them, and certainly once you have setup one of these racks you don�t need to step by step instructions to assemble additional units. 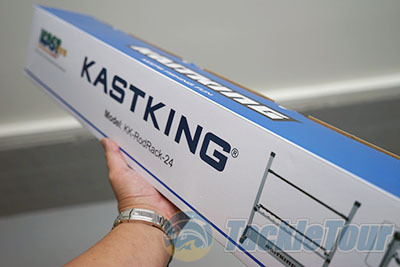 To assemble the rack you basically insert the main stands into the bases which are then held in place with the Kastking branded baseboards. With these six pieces you have the whole basic frame already installed. 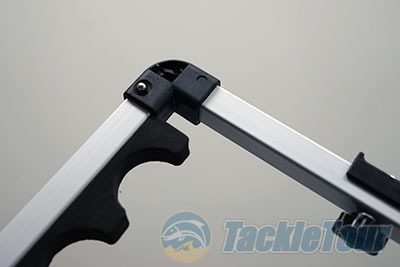 Next assemble the rectangle rod holders which snap into place securely with spring loaded joints, then slide them into place and tighten the tension knobs wherever you want to position them. Snap the two plastic end caps on to the top of your rack and you�re done. The entire setup is painless and is literally be done in just a few minutes. Without a doubt this is the easiest rod rack that I have ever had to assemble.